I’m a little embarrassed to admit that I made these. I’ve always been the sort of person who is thrown into silent hysterics when confronted with people in matching outfits in public. But I’ve noticed something since we’ve had our little guy — whenever Nate has to pick out clothes for Elliot, he always picks stuff that looks exactly like the clothes he wears. No big surprise there I guess (a friend explained this phenomenon by saying that dads like having a “Mini-Me”), I just never thought it would happen to us. I have to admit though, when it’s your own husband and son, it’s actually pretty cute. I made these for a birthday gift for Nate (whose b-day is today!). I hauled out the ol’ birthday garland again, made some cupcakes, bought some balloons and this morning he got to open presents. The one for Elliot I guess technically isn’t a present for him…or is it? I made another shirt (will post soon) for Nate too so it was a totally handmade birthday on my end. 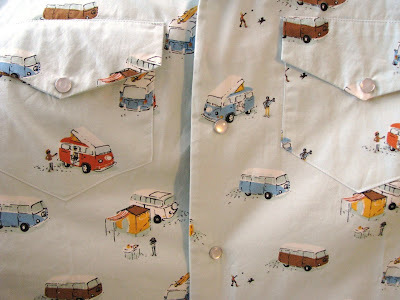 Fabric: Heather Ross’ Happy Campers, no longer available online; it’s out of print and can only be found here and there for ridiculous prices. Pearl snaps: A new addition this time on Nate’s shirt. I have a hand-held snap press for putting snaps on bibs and such, but when I tried using it with the pearl snaps I found it cracked the pearly part. So sad. So if you’re going to try these, definitely use the hammer/spool method as directed on the package. This pattern is definitely not a beginner pattern (as I think I mentioned last time). It’s got plenty of details that can easily frustrate the beginner. Now that I’ve done it a couple of times, I like it but it’s definitely time consuming. We’ll call it a labor of love. I am sad that that fabric is out of print. That’s HILLARIOUS! You’re totally turning into Mom. Those shirts are so fantastic. Love the fabric. And yeah, the whole matching thing — for me, it really depends on the situation. In this case? I’d say it’s totally cute! They are SUPPOSED to be MEN!!! I have always been in the same anti-matchy-matchy camp as you, but now I’ve become a little addicted. It’s sort of a challenge to figure out how to pull it off without it being throw-uppy. I recently invested in a HUGE snap press, like, 37 pounds or something insane like that. It was pricey–$65–but BOY do I love doing snaps now! 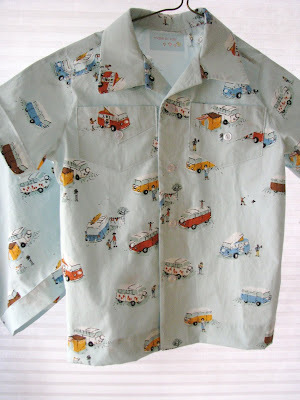 I also went the pearl snap route, and am rocking out on some boy shirts this month… Plus, the little ones can manipulate the snaps themselves, so that’s a nice side benefit! I adore the fabric! The two shirts are sweet. There will come a time when son will not want the same shirt as dear dad. But until then go for it! Love to see a photo of the shirts in action on your guys! I was very mean in my last post and I apologize. You did a nice job on the shirts. thanks for the great inspiration, I am now a made by rae fan, officially!! Hi Rae – I left an award for you on my blog. 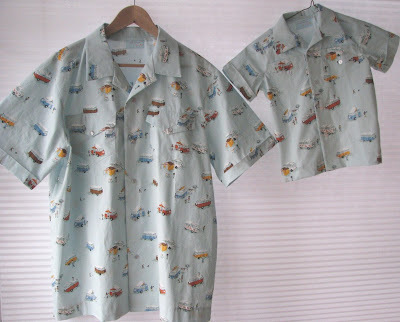 Those shirts are wonderful and I’ve yet to find a little boy who doesn’t want to be just like his dad. You’ll have to take a photo of the 2 of them together in the shirts – not just for your blog but for your son who will be glad to have it when he’s older. The shirts look great! And, I love the fabric…it’s adorable!